Does Thanksgiving get the decorating shaft in your house? I always decorate the fire place mantel but I realized the other day, that I still had this Spring pillow sitting on the couch. Um, yeah, time to update the decor! 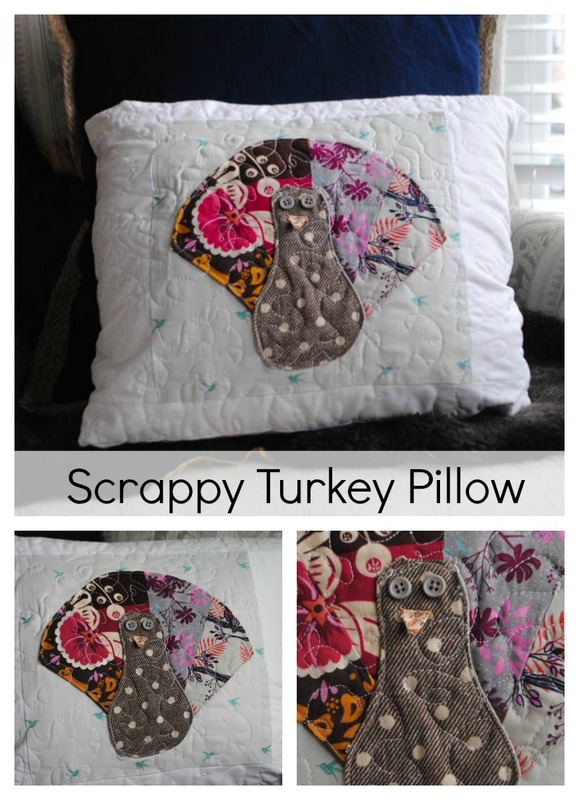 This scrappy turkey pillow is the perfect way to bring a little Thanksgiving pep to your living area! 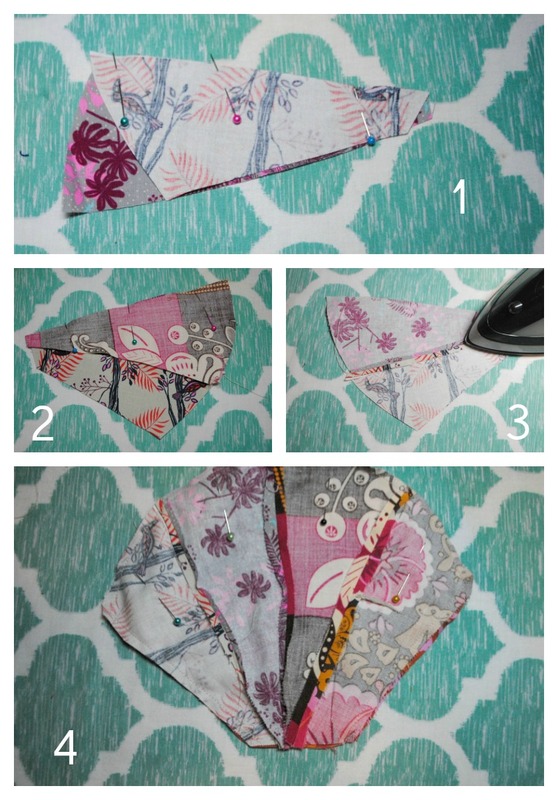 It’s a super, quick project that you can finish in under an hour and uses up those itty-bitty pieces of your favorite fabrics that are just sitting in the scrap bin. I grabbed a few fabrics from my brown scrap bin and then played around, coordinating fabrics until I got the look I wanted. I didn’t have much in the way of orange (is is just me or is it hard to find good orange fabrics?) 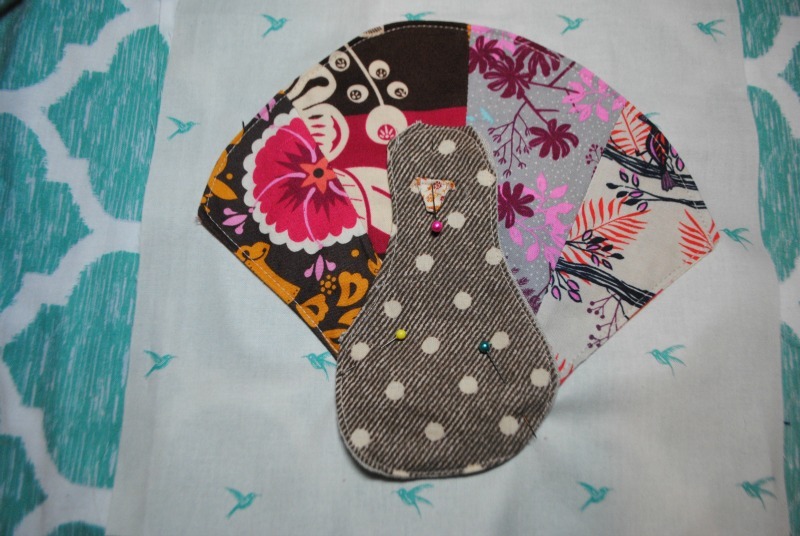 so I stuck with a few bits of Cotton and Steel and Anna Maria Horner beauties. 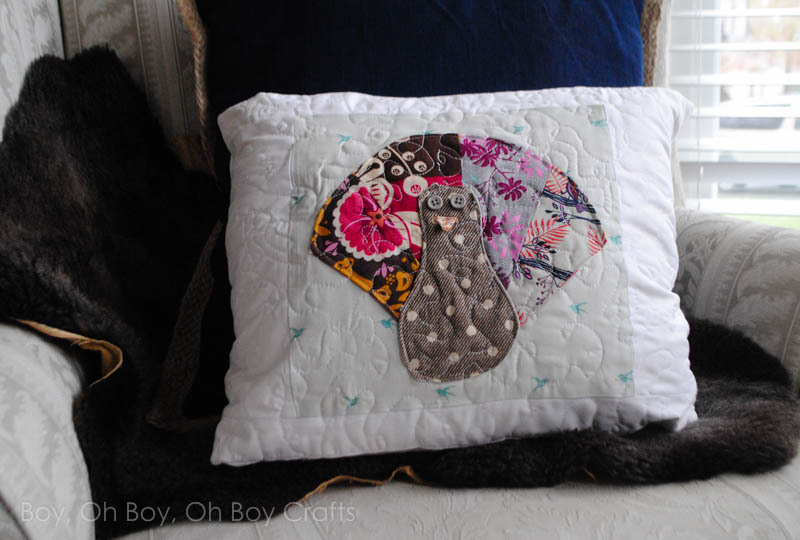 The finished pillow sham measures 16 1/2″ X 12″ and has an envelop style closure but could be used in any manner of pillow styles. Place turkey body pieces, right sides together, pin and sew using a 1/8 inch seam allowance and leaving the bottom open for turning. Turn right side out and press. Topstitch around the outside edge of the turkey body, making sure to press the open seam inward. Cut two scrap triangles for the beak, sew right sides together leaving one side open, turn right side out and sew to the turkey body. Or for a raw edge, cut one beak and “applique” onto the body. To piece the feathers, start with two feathers, pin right sides together and sew using a 1/4 seam allowance. Press the seam open, then continue with the rest of the feather pieces. 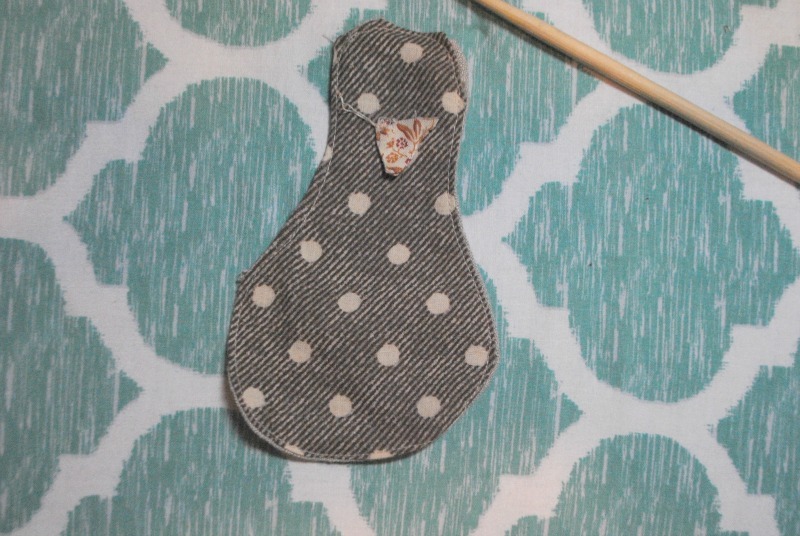 Lastly, place the pieced feather section, right sides together with the feather backing, pin and sew around the outside edge, using a 1/4 seam allowance, leave the bottom open for turning. Attach the turkey feathers to the square piece, making sure to center them before pinning. Topstitch in place, making sure to press the bottom seam inward before closing. 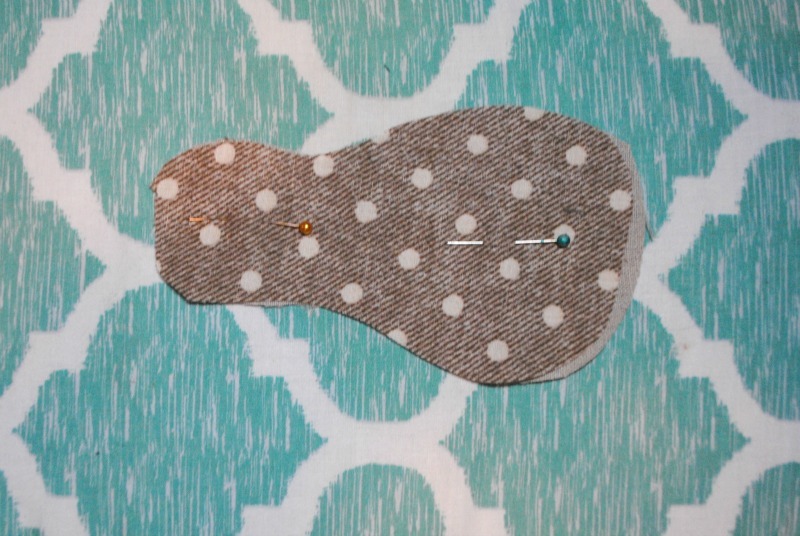 Place the turkey body on top of the feather section, pin, and stopstitch in place. Pin, right sides together each side section, sew using at 1/4 inch seam allowance. Press the seam open and repeat with the top and bottom pieces. 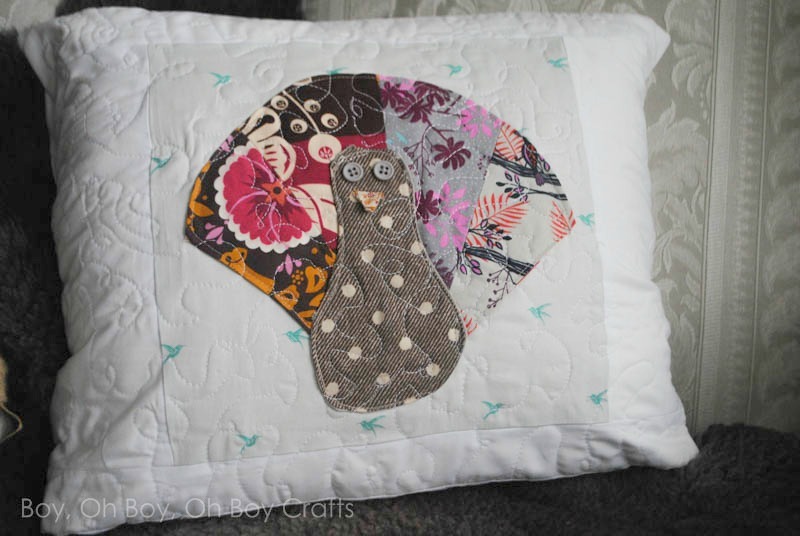 Using safety pins, pin the turkey block to the backing piece and quilt as desired. From here you can decide how you want to finish the pillow. And envelop closing will need two pieces of Kona white that are big enough to hem and overlap. 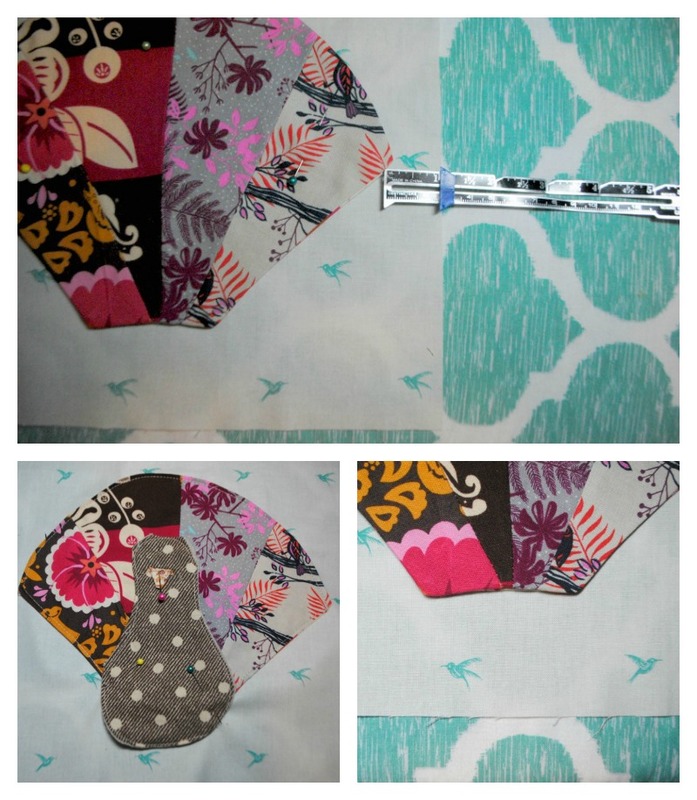 A zippered cover will need one piece equal to the pillow size. Now you have a Thanksgiving worthy pillow to spruce up your living space.